You may specify some options for SecretBurner on this panel. You may reach it by clicking Tools on the left pane. You may select algorithms to wipe files and unused space on disks. 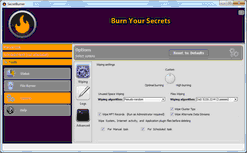 Go to the Wiping Algorithms help page for more information on algorithms SecretBurner uses to burn your files and wipe unused disk space. Optimal burning: Pseudo-random for both files and unused space. High burning: DoD 5200.22-M (3 passes) for both files and unused space. Custom: Select the algorithms manually. Select manually a wiping algorithm for wiping unused disk space. When you change this settings, the Wiping settings knob will turn to Custom. Select manually a wiping algorithm for wiping files. When you change this settings, the Wiping settings knob will turn to Custom. Select this option if you want SecretBurner to wipe free parts of the clusters where the file resides. Select this option if you want SecretBurner to wipe files cleaned in the System, Internet Activity, and Application plugins sections before deleting them. Select this option if your want SecretBurner to wipe records of small files stored directly in the NTFS Master File Table (MFT). Applicable to the NTFS file system only. Click this button to view the log. You may see an example of the log on the Log help page. 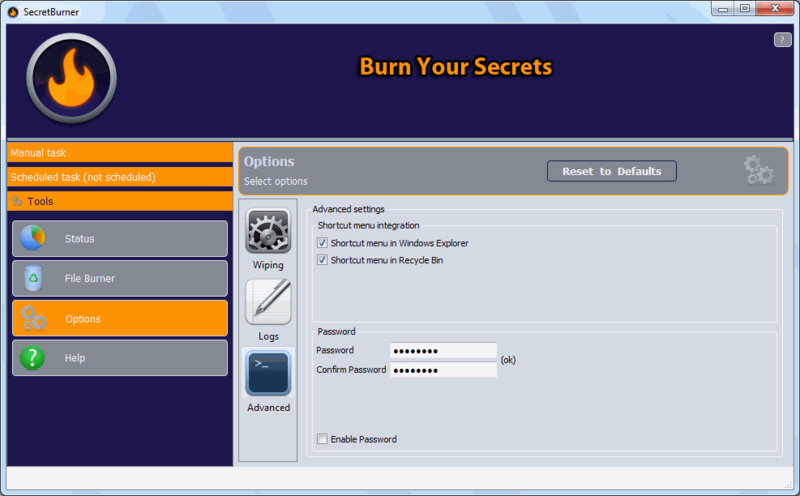 Select this option if you want SecretBurner to burn (wipe) files directly from Windows Explorer. Delete/Wipe with BYS will appear on the file shortcut menu. Select this option if you want SecretBurner to burn (wipe) deleted files stored in the Recycle Bin. Securely Empty with BYS sill appear on the Recycle Bin shortcut menu. 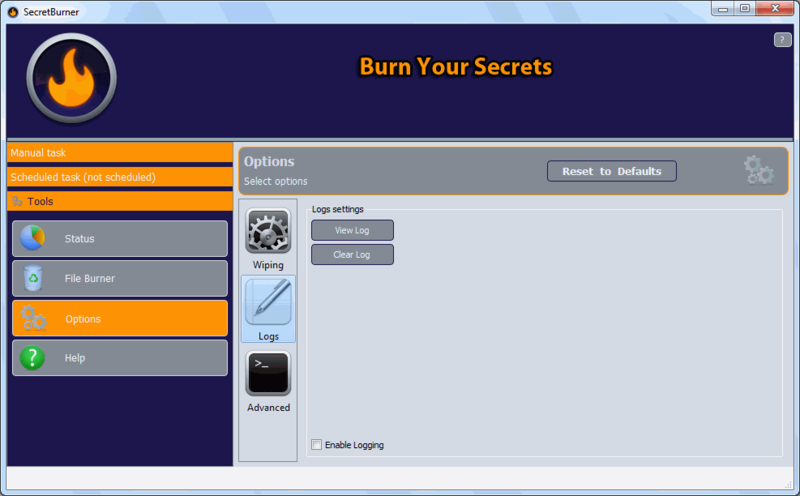 Enter the password if you want to protect access to SecretBurner with a password. Re-enter the password to confirm that you have entered your password correctly. Select this option if your want to protect access to SecretBurner with a password.